The notable thing about this postcard is the high fence at the top of the brae, presumably keeping people out of the Army Camp on the links. 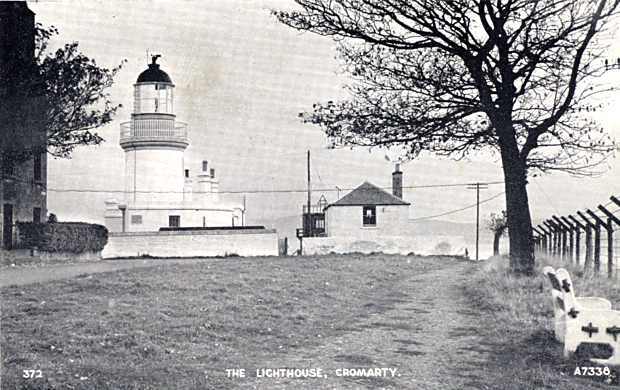 There are also a number of electric or telephone wires running from Reay House and the Lighthouse to the links. There is a triangular construction on top of the lookout tower. picture #298 shows a painting of much the same view. Gun carriers. The Polish soldiers asked myself & my contemporaries to go and buy 'one bread' (with minimum English, what they called a loaf), at Matheson's bakery. A loaf then was about 5d (2p today). Going to the shops for them had its rewards, (as 9/10 year olds) we were allowed to sit at the controls of trucks & bren gun carriers.